BUCHANAN, New York -- Senator Chuck Schumer is calling for a probe into possible groundwater contamination from the Indian Point nuclear power plant. In a statement, Schumer says the investigation should include a focus on why a water pump at the Entergy facility failed. Governor Andrew Cuomo has already ordered a state probe. The apparent overflow spilled highly radioactive water into an underground monitoring well, but nuclear regulators said the public isn't at risk. 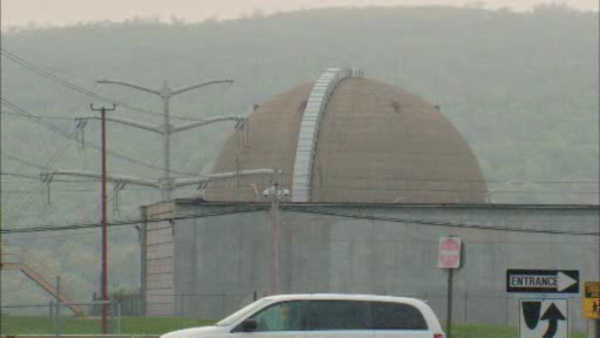 Indian Point officials first reported on Friday that water contaminated by tritium leaked into the groundwater under the facility. The contamination has remained contained to the site, Cuomo said. "Our first concern is for the health and safety of the residents close to the facility and ensuring the groundwater leak does not pose a threat," Cuomo said Saturday in a statement. The leak occurred after a drain overflowed during a maintenance exercise while workers were transferring water, which has high levels of radioactive contamination, said Neil Sheehan, a spokesman for the Nuclear Regulatory Commission. Normally, a sump pump would take the water and filter it into another treatment system, but the pump apparently was out of service, Sheehan said. After the drain overflowed, the water seeped out of the building into the groundwater. It was unclear how much water spilled, but samples showed the water had a radioactivity level of more than 8 million picocuries per liter, a 65,000 percent increase from the average at the plant, Cuomo said. The levels are the highest regulators have seen at Indian Point, and the normal number is about 12,300 picocuries per liter, Cuomo said. Contaminated groundwater would likely slowly make its way to the Hudson River, Sheehan said, but research has shown that water usually ends up in the middle of the river and is so diluted that the levels of radioactivity are nearly undetectable. "We don't believe there's any concern for members of the public," Sheehan said. "First of all, this water's not going anywhere immediately ... and, again, because of the dilution factor, you wouldn't even be able to detect it were you to take a direct sample." A spokesman for Entergy Corp., the New Orleans-based company that operates Indian Point, said the overflow was "likely the cause of the elevated tritium levels." "Tritium in the ground is not in accordance with our standards, but I think people should keep in mind there's no health or safety consequences," spokesman Jerry Nappi said. "There is no impact on drinking water on or off site." There has been a history of groundwater contamination at Indian Point. A federal oversight agency issued a report after about 100,000 gallons of tritium-tainted water entered the groundwater supply in 2009, and elevated levels of tritium also were found in two monitoring wells at the plant in 2014. Officials said then the contamination likely stemmed from an earlier maintenance shutdown. An Associated Press investigation in 2009 showed three-quarters of America's 65 nuclear plant sites have leaked tritium, a radioactive form of hydrogen that poses the greatest risk of causing cancer when it ends up in drinking water.